العلاقات الخارجية > News > Details Academic from Islamic University of Gaza wins L’Oréal-UNESCO Fellowship Award. Academic from Islamic University of Gaza wins L’Oréal-UNESCO Fellowship Award. Professor Fatin abu-Shuqa, Assistant Professor at the Mathematics Department, won L’Oréal-UNESCO for Women in Science fellowship in the Arab States 2018 for her research in mathematics and combinatorial complex geometry of classical groups in flag manifolds. 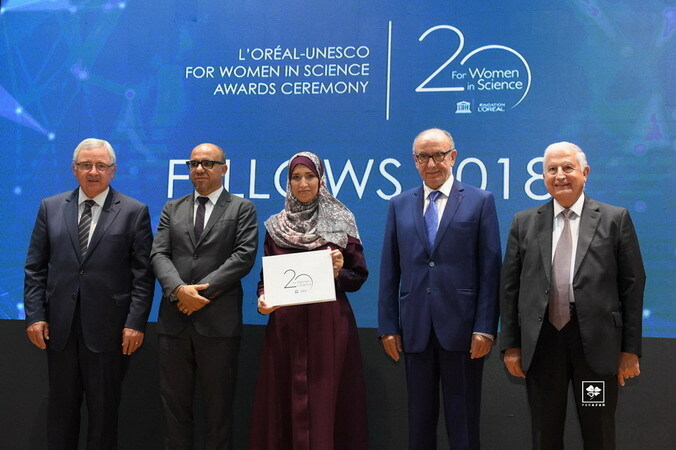 L’Oréal-UNESCO in Arab States has announced Women in Science fellowship 2018 in cooperation with the National Council for Scientific Research. Out of one hundred nominated for the awards, six scientists have been chosen to receive awards on their scientific researches under the fifth annual award aimed to support the Arab women and encourage them to enter the profession and to assist them once their careers are in progress. The winners’ names were announced in an official ceremony held in Higher Institute for Business, Beirut, under the auspices of the Minister of Education Marwan Hamada. The ceremony was attended by a number of political figuress, representatives of academic and research, institutions, representatives of NGOs, and journalists. The L’Oréal-UNESCO for Women in Science Partnership was inaugurated in 1998 to highlight that scientific research, regardless of the field, is a fruit of intelligence, creativity, and mania of women worldwide. So far, the program has supported (3124) researchers, awarded (102) scientists, and provided a scholarship for (3022) women from (117) countries to pursue their higher education and complete their Ph.D. and postdoctoral studies. It merits noting that Prof. Fatin abu-Shuqa got her MSc with honor from the Islamic University of Gaza in 2007, and she won a scholarship offered by the Islamic Bank for Development, Saudi Arabia, in 2013 to complete her Ph.D. In 2016, she got her Ph.D. from Ruhr University Bochum, Germany in combinatorial complex geometry.